Originally released back in 1973, Perfection was one of the most popular board games ever released by the board game company Lakeside. With how popular the game was, it is not surprising that there were a couple Perfection spin off games created throughout the years. Most of these spin offs added different types of shapes but kept the gameplay intact. Today’s game Mr. Pop! (later renamed Mr. Funny Face) takes a different approach as it combines Perfection with a Mr. Potato Head. Instead of placing pieces on the appropriate spaces on a game board, you are trying to assemble a face. I can’t say that I had high expectations for Mr. Pop! as it looked like it was designed for young children. In some ways Mr. Pop! finds a way to improve upon its’ inspiration Perfection, but it is just too simple and repetitive to remain interesting for very long. How to Play Mr. Pop! Insert the head into the base. Tilt back the head until it locks into place. Place all of the face pieces on the table so the player can see all of them. The player will choose one of the cards that they will try to assemble. The cards with a one on it are the easiest and the three cards are the hardest. Push the on/off switch down. Turn the dial clockwise until it stops. When the player is ready they will pull up on the on/off switch starting the timer. The player will then try to match the picture on the card with the face connected to the base. The player will use the various face pieces to try and match the card. This player will have to assemble the face on the card before they run out of time. When a player thinks they have completed the face, they press down on the on/off switch in order to stop the timer. If they are correct they win the round. This player has completed the face shown on the card they chose. If the player runs out of time, the face will be launched forward and the pieces will be knocked off the face. My Thoughts on Mr. Pop! In general I don’t really have strong feelings either way about Perfection. The game can occasionally be fun but it gets dull rather quickly. Before playing Mr. Pop! I can’t say that I had high expectations for the game. 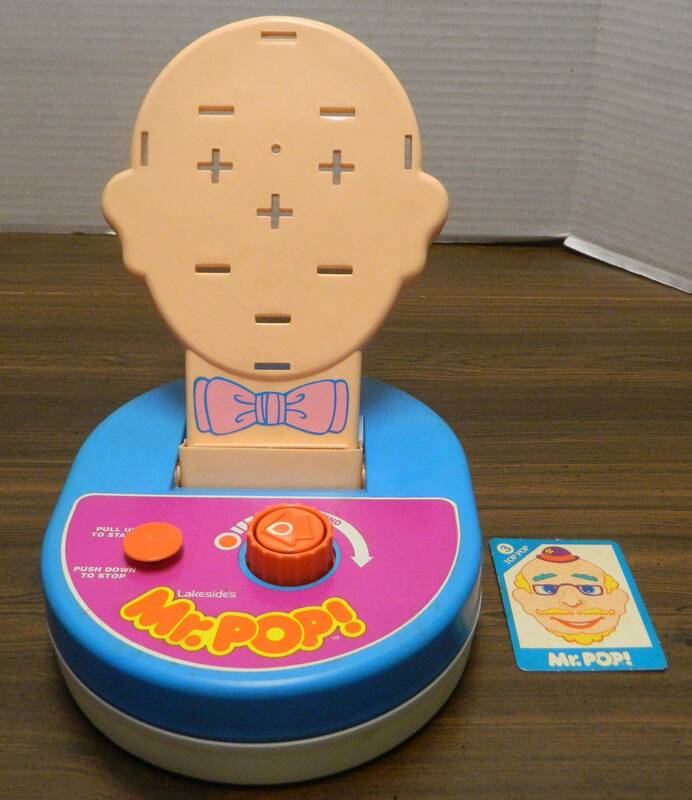 It honestly looked like an attempt to make Perfection more appealing to younger children. 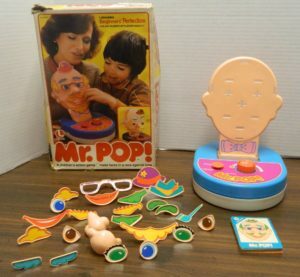 As I mentioned earlier the game just looked like Mr. 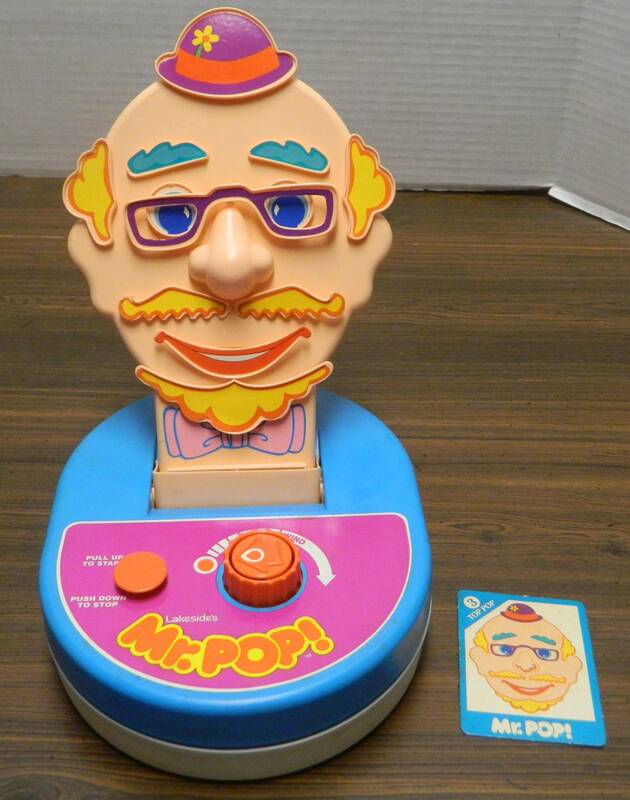 Potato Head was turned into a game where you tried to assemble his face as quickly as possible. While Mr. Pop! has its own problems, I was actually surprised that it was better than Perfection in some ways. I think the area where Mr. Pop succeeds the most over Perfection is that the theme works better leading to a more enjoyable game. The original Perfection had no theme whatsoever as you just placed various shapes in their corresponding spots on the game board. In Mr. Pop! there is actually a point as you are assembling a face. The theme is still quite thin but there is a point to the gameplay. While the gameplay is still quite similar to Perfection, I found it to be more enjoyable assembling a face than placing shapes on a board. I was genuinely surprised that the “Mr. Potato Head” gameplay was more enjoyable than I was expecting. The gameplay is far from deep but there is something satisfying about it. Assembling the face gives you a concrete objective that you have to complete in a given amount of time. Racing to assemble the whole face in time can be fun. If I stopped at this point I would say that Mr. Pop! is superior to Perfection. Unfortunately Mr. Pop! has a couple fatal flaws. The biggest problem with the game is that it just isn’t all that challenging. This is to be expected as the game was designed for children after all. While I can see the game being challenging for younger children, it is going to be way too easy for older children and adults. The game has three difficulty levels and yet none of them are very challenging. The level three cards actually require you to add a lot of pieces to the face but the game gives you plenty of time where you aren’t rushed in order to finish in time. The other reason why Mr. Pop! is worse than Perfection is that there just aren’t enough cards in the game. The game only has nine cards. With only nine cards you will be making the same faces over and over again. I have no idea why the game only included nine different cards. The game has 25 different pieces so the game could have created plenty of other face combinations. They could have even added a fourth or fifth difficulty level which would have been more challenging for older kids and adults. It probably wouldn’t be that difficult to make your own cards, but I don’t know why the game couldn’t have just included more to begin with. These two problems lead to Mr. Pop! becoming repetitive rather quickly. You can have some fun putting together some of the faces, but after a while it just becomes more and more of the same. Like the original Perfection, Mr. Pop! is one of those games that you can only play for a short period of time and then you put it away for another day. The final issue I had with Mr. Pop! is that it is kind of debatable whether it is actually a game or just an activity. Mr. Pop! doesn’t really have the structure found in most games. There is no scoring and at least the version I played doesn’t even have rules for how you play the game with multiple players. Basically all you can do is take turns trying to complete your face in time. If you fail to complete the face in time, you are eliminated from the game. If multiple people complete their faces in time you will either have to play multiple rounds or you will have to compare who completed their face quickest. Even with these house rules, they don’t fix the fact that there is no player interaction in the game. The game is basically a solitary game that you take turns playing. I want to wrap up by quickly talking about the game’s components. I already mentioned that I think it is stupid that the game only includes nine cards. Other than that I think the components are pretty solid. The mechanical components actually work pretty well for being almost forty years old. This is somewhat subjective based on how well the game was taken care of. As long as there was some care taken, I would imagine most copies of Mr. Pop! still work pretty well. While I would have still preferred there to be more face pieces, with 25 pieces there are still plenty of options for different faces that you could create. The various face pieces are also made of solid plastic so they should last if you take care of them. Should You Buy Mr. Pop!? I originally thought Mr. Pop! was going to just be a simplified version of Perfection for young children. In some ways I was right and in other ways I was wrong. Mr. Pop! plays a lot like what you would get if you combined Perfection with a Mr. Potato Head. This might sound like a stupid idea but in practice it is actually more enjoyable than I was expecting. It is actually more fun to assemble the faces than it is to arrange pieces on a game board like in Perfection. The problem is that Mr. Pop! is too easy for older children and adults. The game gives you too much time which makes it easy to complete even the most challenging cards in time. It also doesn’t hurt that the game has so few cards. This leads to Mr. Pop! getting repetitive pretty quickly where you will only want to play the game for a short period of time before putting it away for another day. Add in the fact that it is debatable whether Mr. 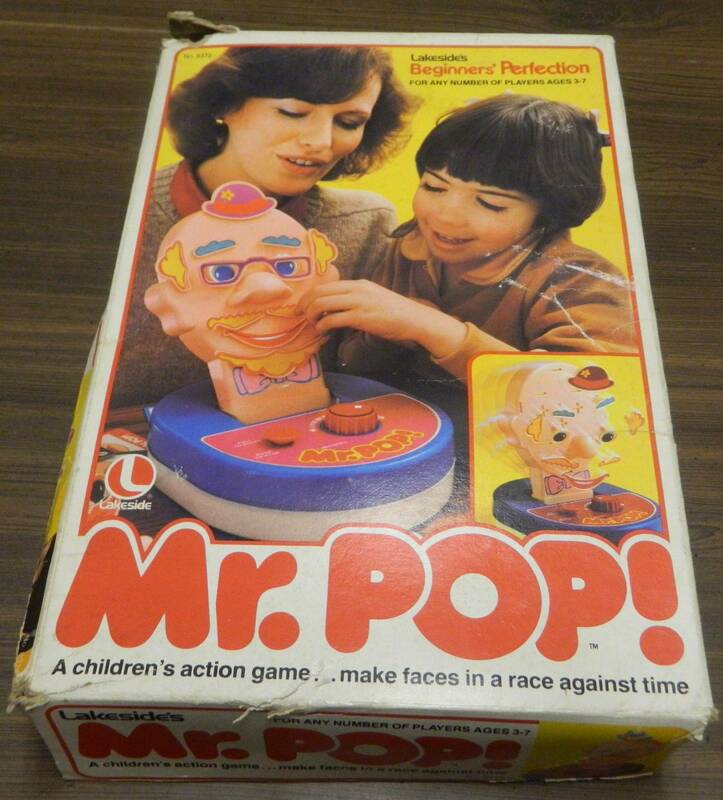 Pop is more of a game or an activity. If you have never really liked the Perfection mechanic of placing shapes in a designated amount of time, I don’t think you will like Mr. Pop!. Younger children will probably have fun with the game and even adults could have a little fun in short doses. I would probably only recommend picking up Mr. Pop! though if you can get a good deal on the game. Improves on the theme and the gameplay is more enjoyable than Perfection. Young children should really enjoy the game. Way too easy for everyone except young children. Has way too few cards leading to the game getting repetitive rather quickly.